Q and A of the Day: Anti-Dark Matter? Since we've had a couple of stories on dark matter recently, we wanted to feature some Q and A's we've received on the topic over the years. Q: Is it possible for the existence of an 'anti-dark matter?' It was long predicted for the existence of anti-matter in theory so it seems plausible to me. Read more about Q and A of the Day: Anti-Dark Matter? Q and A of the Day: Where did the name "Chandra" come from? Q: Where did the name "Chandra" originate? A: NASA's premier X-ray observatory was named the Chandra X-ray Observatory in honor of the late Indian-American Nobel laureate, Subrahmanyan Chandrasekhar (pronounced: su/bra/mon'/yon chandra/say/kar). Known to the world as Chandra (which means "moon" or "luminous" in Sanskrit), he was widely regarded as one of the foremost astrophysicists of the twentieth century. Read more about Q and A of the Day: Where did the name "Chandra" come from? Q and A of the Day: What is electromagnetic radiation? Q: What are the different types of electromagnetic radiation and what are they used for? A: There are many kind of electromagnetic radiation (EMR) and they are distinguished by their wavelengths if you consider EMR as waves. Read more about Q and A of the Day: What is electromagnetic radiation? Black Holes on the Move? Q: Can black holes move through space? A: Black holes can indeed move through space. The really massive black holes at the centers of galaxies will stay there unless something catastrophic happens, like a direct collision between two galaxies. Read more about Black Holes on the Move? Q: How can we detect black holes? A: There are two basic ways we can detect whether there's a black hole. Black holes are, of course, dark by definition - not even light escapes them! Read more about How can we detect black holes? Why is time influenced by gravity? Einstein's theory of relativity showed that space and time are not independent. One consequence of this is that time can appear to pass more rapidly or slowly for two different observers depending on their relative velocities and acceleration. According to the theory of relativity, acceleration and gravity are equivalent, so gravity can affect the flow of time. Where in a galaxy would you expect to find Type I and Type II supernovas? 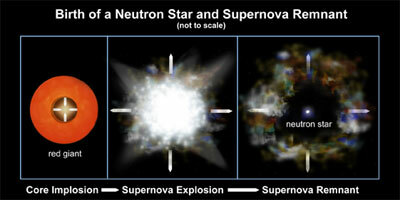 The two basic types of supernovas are Type Ia and Type II. Other types, such as Types Ib and Ic, are unusual supernovas that have most of the properties of type II supernovas. Q and A of the Day: How Have Telescopes Changed Things? This set of queries came in from a couple of students, and we liked senior scientist Martin Elvis's responses so much that we thought we'd post them for everyone to see. How do you feel the telescope has changed the scientific view on our universe? Hugely! Before the telescope we thought the universe was big, but we really had no idea how big. Telescopes immediately showed us that there were vastly more stars out there than we had thought, but it took lots of work making bigger and better telescopes -- and learning how to use them. It took lots of work before we started to know how far away the stars were (using "parallax"), where we fit into the Milky Way, our galaxy (on the edge - dust in space hid our view so we thought we were in the middle), and the Milky Way into the scheme of all galaxies. It's a LONG story, and always our view widens, and is still widening. Now we can see back to when the galaxies were forming, but we have only just begun to find planets around other stars. Read more about Q and A of the Day: How Have Telescopes Changed Things? Q and A of the Day: White Dwarfs vs. Neutron Stars? What are five differences between white dwarfs and neutron stars? The major difference is due to the way in which they are formed. 1. White dwarfs are formed from the collapse of low mass stars, less than about 10 time the mass of the Sun. This star loses most of its mass in a wind, leaving behind a core that is less than 1.44 solar mass. On the other hand, neutron stars are formed in the catastrophic collapse of the core of a massive star. Read more about Q and A of the Day: White Dwarfs vs. Neutron Stars?